Given that fish change hands several times, from fisherman to fish house, to wholesaler, etc., it is easy to see how some fish might be misidentified as they are skinned, processed, and packed. However, the extent of the mislabeling identified by Oceana makes it clear there is a real attempt by some outlets to defraud the public. 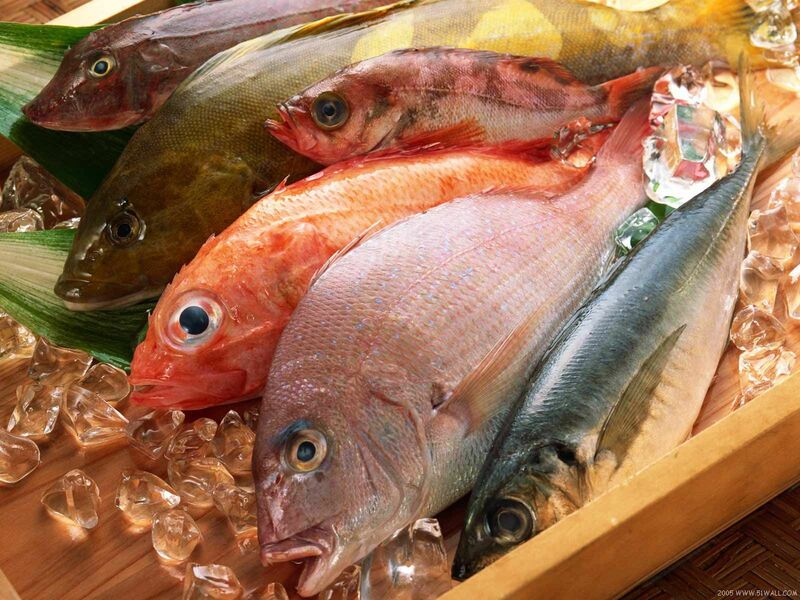 From 2010 to 2012, Oceana conducted one of the largest seafood fraud investigations to date. They collected over 1,200 seafood samples from 674 retail outlets in 21 states to determine whether they were accurately labeled. Based on results of DNA analyses, Oceana found that one-third (33%) of their samples were mislabeled according to U.S. Food and Drug Administration guidelines. Oceana’s results are very consistent with those of a smaller 2011 study conducted by Consumer Reports. Figure 3 from Oceana report documenting seafood fraud (image source) Click on graphics to enlarge. 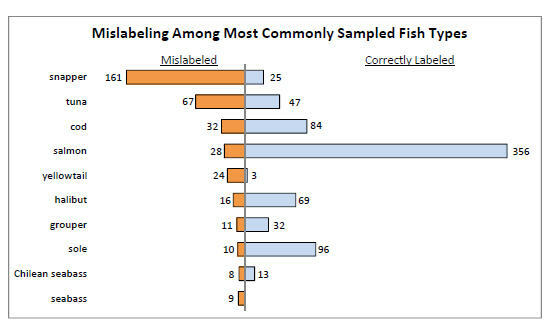 The most commonly mislabeled fishes in Oceana’s study were snapper (87% mislabeled) and tuna (59% mislabeled). Essentially, if you purchase snapper (i.e., red snapper Lutjanus campechanus) you can rest comfortably, assured you are getting something else. 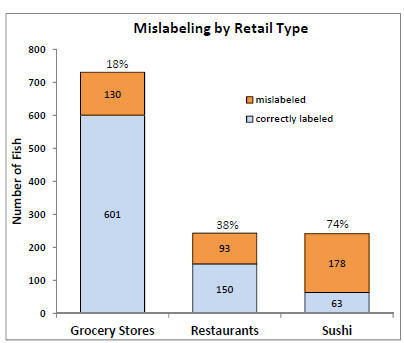 Perhaps the most revealing graphic in the Oceana report, and the one that most compellingly dispels the notion that the mislabeling is accidental, shows the incidence of mislabeling based on retailer type. Grocery stores, from which the majority of Oceana’s samples came, mislabeled only 18% of fish. The mislabeling rate was twice as high among restaurants (38%) and four times higher than that rate (74%) among sushi venues. Very clearly, restaurants and sushi venues are intentionally misrepresenting low cost fish as more desirable- and more expensive- species. 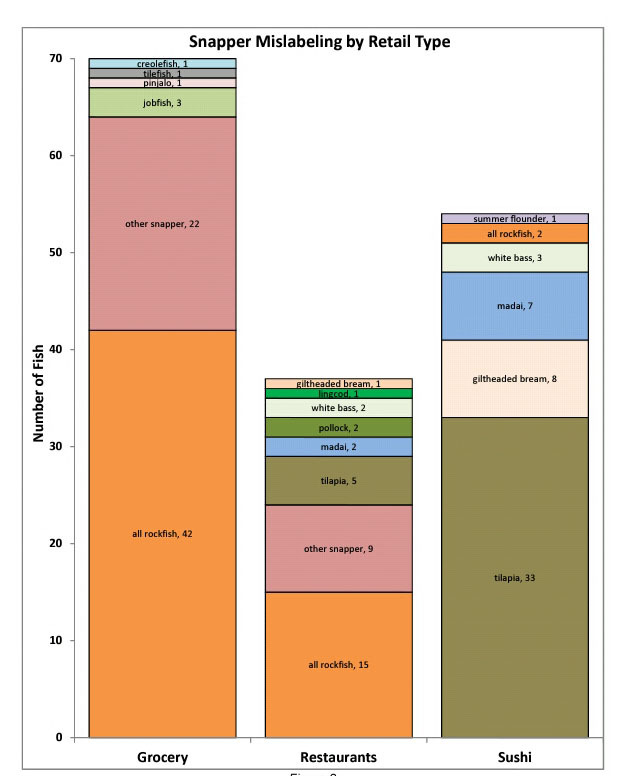 Among the fishes in Oceana’s samples, snapper had the largest variety and number of species substitutions. Thirty-three different species were substituted for snapper, including substitutions of one snapper species for another (for example, lane snapper sold as red snapper). Nothing to be too pleased about, but at least in grocery stores and restaurants, if you’re not getting snapper, you’re at least getting a wild-caught fish of some sort. In sushi venues, you’re paying top dollar for farm-raised tilapia, a freshwater fish. Tuna was the second most commonly mislabeled fish in Oceana’s study. 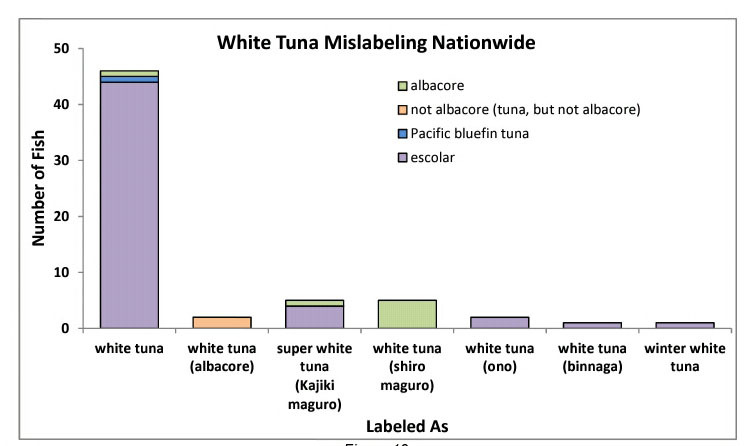 However, if you look at what passes for “white tuna” the incidence of mislabeling increases (94% ). Most sales of “white tuna” (aka albacore tuna Thunnus alalunga) are in sushi venues and the most commonly substituted species is escolar, the so-called ex-lax fish. So, if you do not want white tuna, Beel recommends you order it at a sushi bar: its guaranteed to be something else. The Oceana report is readily downloaded and is a quick read because of the numerous figures. Beel recommends you take a look. The studies by Consumer Reports, Oceana, and several local news agencies are beginning to gain traction with the public. Beel used Google Trends to examine changes in the number of internet searches for the phrase “seafood fraud.” Please friends, allow Beel to present the results of that query. Google Trends analysis of “seafood fraud, 2009-2013. Click on graphic to enlarge. Google Trends can display searches back to 2004, but searches for seafood fraud were so infrequent that they do not even begin to register until late 2011, coincident to the publication of the results of Consumer Report’s investigation. Since that time, there has been a steady increase in searches- and interest- in seafood fraud. The greatest number of searches, to date, followed release of Oceana’s report. The public is becoming informed. Politicians are beginning to act. Woo hoo, says Beel! This entry was posted on February 26, 2013 by denstormer in Beel Recommended, Google Stuff and tagged fish fraud, Google Trends, queryomics, USA.